How to Convert Regular Badge Holder Into Clip On Badge Holder ? The adhesive badge clip comes with swivel metal badge clip or bulldog clip is a great solution to convert a regular badge holder into clip on badge holder. 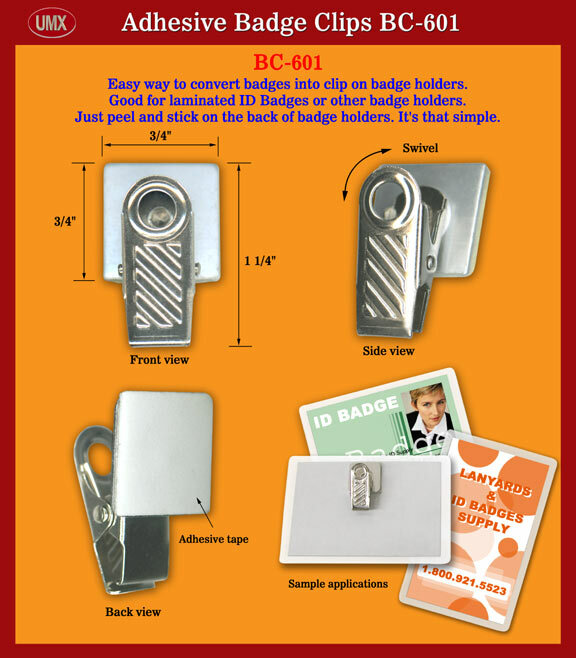 The adhesive badge clips come with adhesive tapes on the back of metal badge clips. Just peel and stick on the back of badge holders. The adhesive badge clips provide an easy way to convert your laminated name badges or ID badge holders into clip on name badge holders. You are viewing Lanyards > Clips > Adhesive Metal Badge Clip with Adhesive Back Tape is a great way to change the regular badge holder into clip on style of badge holder.